I'm going to let you in on a little secret. I find it immensely satisfying to use pore strips. There's something about actually seeing all the gunk come out of my pores that just makes me feel clean and ready to take on the world. So it only stands to reason that Boscia Pore Purifying Black Strips have become a staple in my skincare regimen. The peel-off strips contain charcoal powder (which draws out impurities and detoxifies) silica (to control excess oil), witch hazel extract (a natural astringent that tightens the look of pores) jojoba leaf (an antioxidant that combats free radicals and protects skin against premature aging) and willowherb (an anti-irritant that calms skin inflammation and reduces redness). They work to absorb pore-clogging dirt and oil and also reduce the appearance of pores and blackheads. Pretty groovy, right? These strips work much the same as any others on the market -- wash face and keep your nose wet, peel the strip away from the plastic, place the smooth side against the bridge of your nose and leave it there for about 15 minutes. When you remove ... voila! Clearer pores instantly, and all the evidence right there in the palm of your hand. 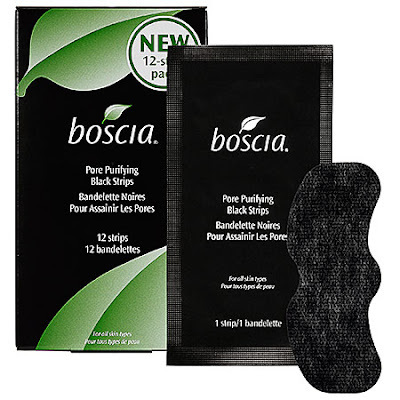 Boscia Pore Purifying Black Strips are $28 for a package of 12 at sephora.com.